First impressions are everything. 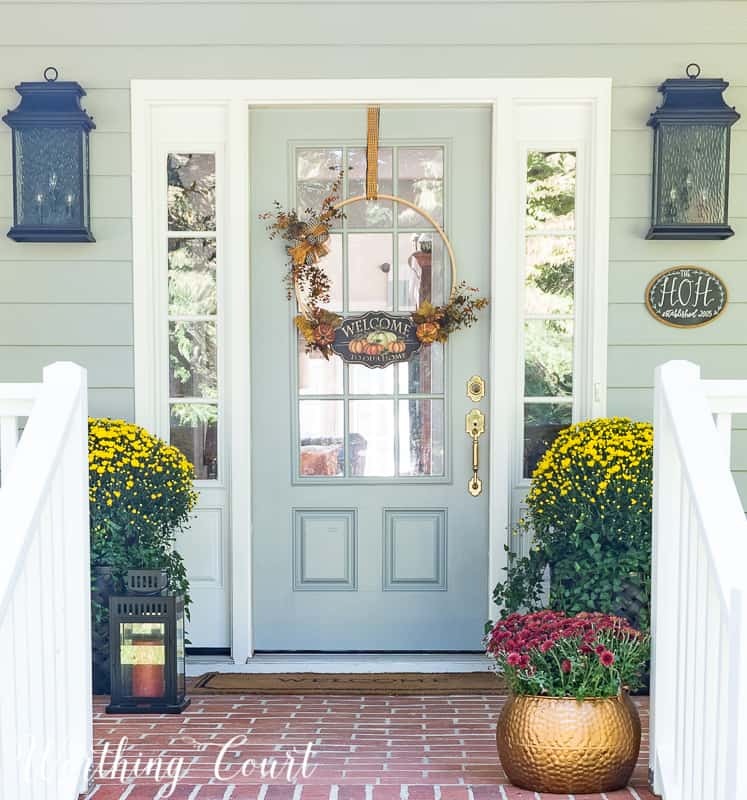 Here’s how to decorate a stunning fall front porch without going to a lot of expense or effort. My mantra for the fall decorating in my home is twofold this year. One is “keep it simple” and the other is “use what you already have”. I held onto those two guidelines as much as I could when decorating the inside as well as the outside of my home. I did break down and spend a few dollars to make a new wreath for the door though, because – well…new fall wreath, right? Click RIGHT HERE to see how super easy it is to make a wreath just like this one. I am in total love with how it looks on my front door! It’s so different than anything I’ve ever had before. For those of you who are long time readers, you may notice that the exterior of our home is a different color. We painted our entire house, brick, siding and doors, in Sherwin Williams Network Gray. On the brick and siding, the Network Gray is mixed at 85% intensity, but it’s full strength on the doors. I’ll give a full blown look at the exterior as soon as we get a little farther along with some of the other updates that we want to do. 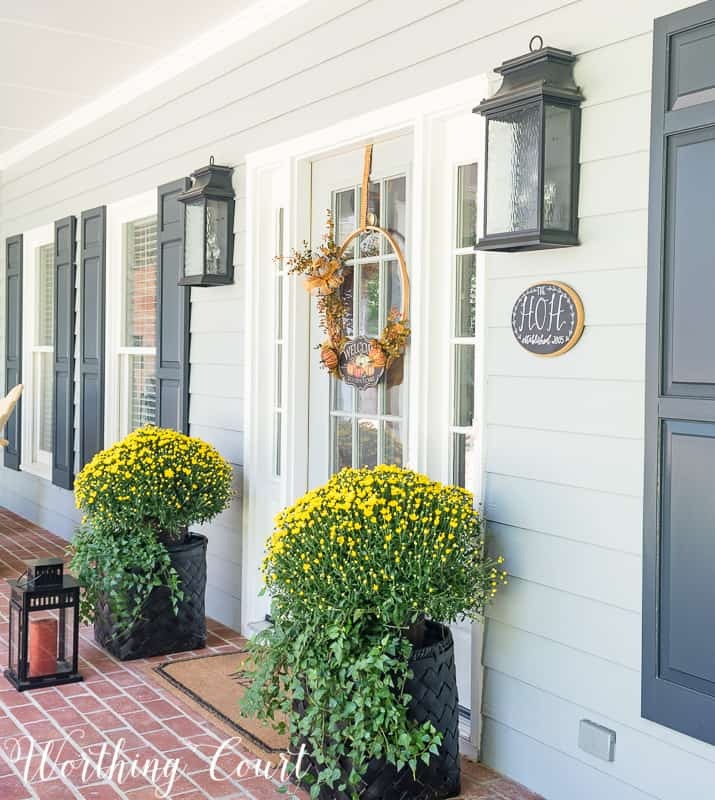 Take a look at last year’s fall porch by clicking HERE and my porch from the year before by clicking HERE, to see what a difference the painted siding makes! But, back to this year’s porch. I had no choice but to purchase mums, but I did keep the cost down by pulling out the summer flowers that were in these baskets and simply placing the potted mums on top of the dirt. #LazyDecorator I left the ivy that I planted there for the summer because I like the texture and color, plus it helps to hide the bare underside of the mums. I purchased these large baskets on clearance several months ago and inserted a large pot down inside each one to turn it into a planter. They originally had a whitewash finish on them, but a few coats of black spray paint gave me the look that I was after. And finally, to help draw your eye up the steps and to the door, I placed a burgundy mum in an old brown metal pumpkin planter that I spray painted copper. 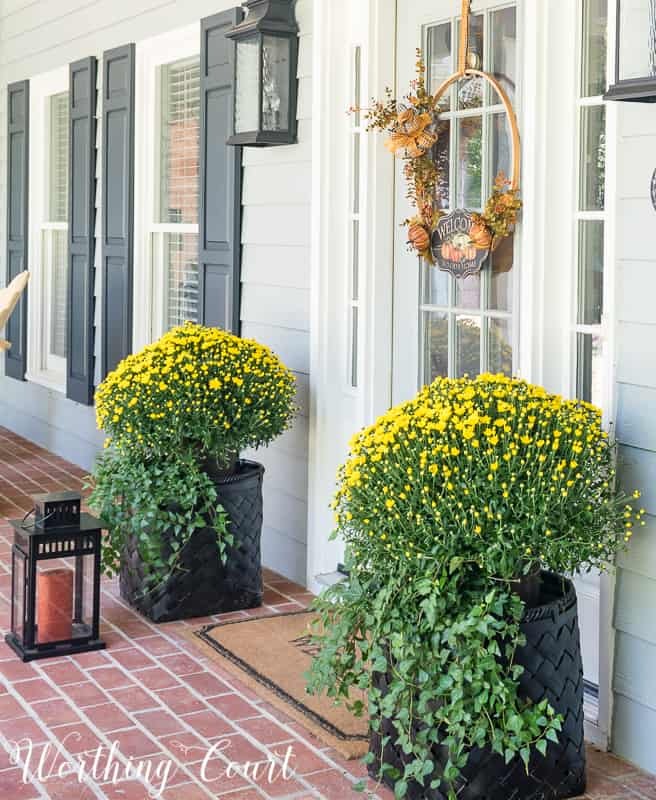 I’d have my front porch filled with mums of every color if I could! Want to see what’s behind that door? 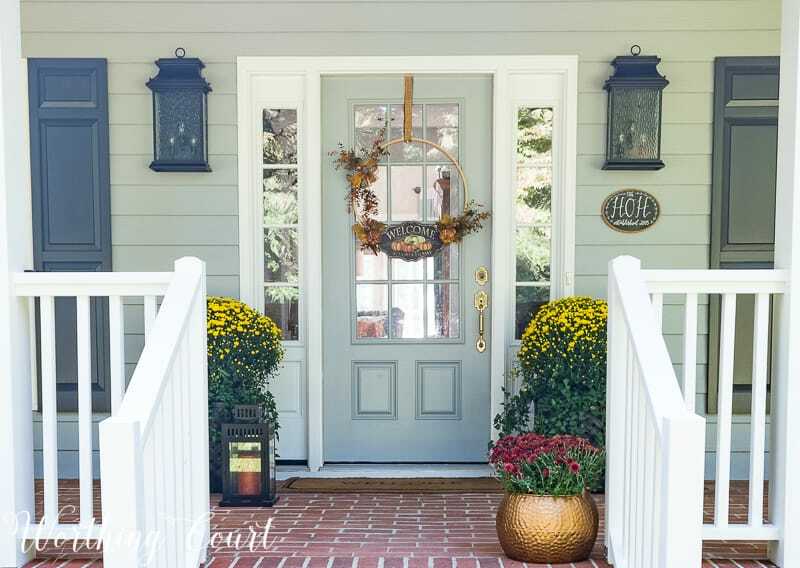 Click HERE to explore my fall foyer decor and get ideas that you can use in your own home. Beautiful! You’ve done it again, Suzy! What a beautiful change with the new house colors. Love the copper pot. I have gone copper crazy this year. It’s such a fun metallic. Love how the copper pot turned out and how it coordinates with that cute wreath. Perfect for fall!!! Lovely. I love to decorate for fall. I love the textured outside of the copper pot your painted, You can never have too many MUMS. they speak fall to me too. thanks so much for the new inspiration! You have a sharp eye, Mary. 😀 Yes, that’s an embroidery hoop. I’ll be sharing the tutorial next week! Your front porch looks great. Love the new wreath. Beautiful front porch! Your wreath is very pretty! I bought the same Welcome to our Home sign and hung it over my stove using a clear 3-M hook. Fun to see it used in different ways. Such an inviting entry – well done! Not just simple – simply stunning! 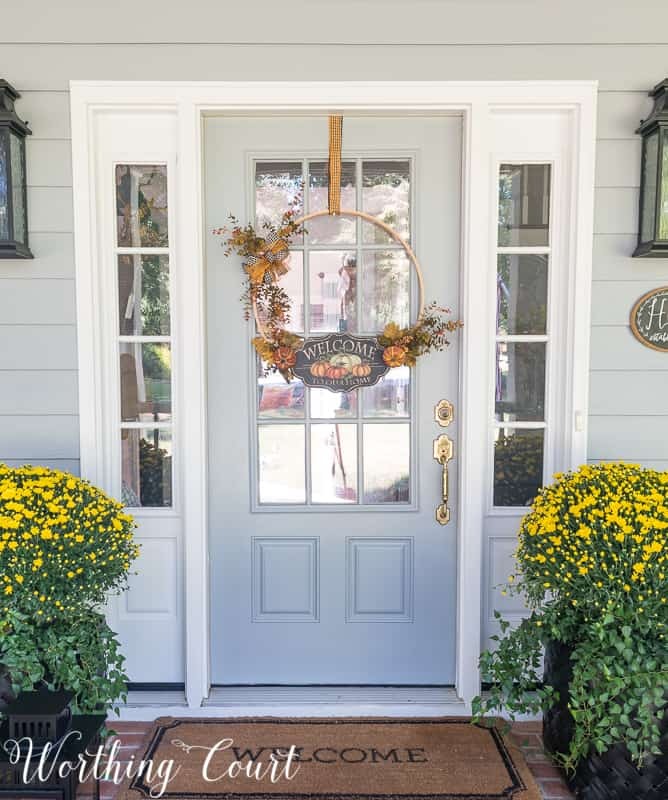 Love the new wreath, the new color of the house and of course always love mums! Can’t wait for the tutorial on the wreath. Your front porch is so lovely. I would love to pur chase some pots of mums, S they look so pretty. Here in Northwest NJ it is warm, the mums don’ t seem to last no more than a week to 10 dsys. It is not just me but a lot of l the homes I pass. I don’t know what to do to keep them lasting longer? I love your front door wreath! I am a quilter, but have not used my quilting hoops in years. I’m thinking it may be time to repurpose at least one into a wreath! I had to laugh about your use of spray paint to get the colors and finishes you want. I consider spray paint one of my best tools in my decorating arsenal. It is such an easy way to turn something not so pretty, or not quite right, into something that is stunning. Thanks for sharing! Your porch looks great! I love that’s is not cluttered. I love the mums, but will have to wait a few weeks here in Florida to put them out. I love the mums and your new wreath! The copper pot looks great too!! I love everything you do.I guess that means “I just love you too”!. 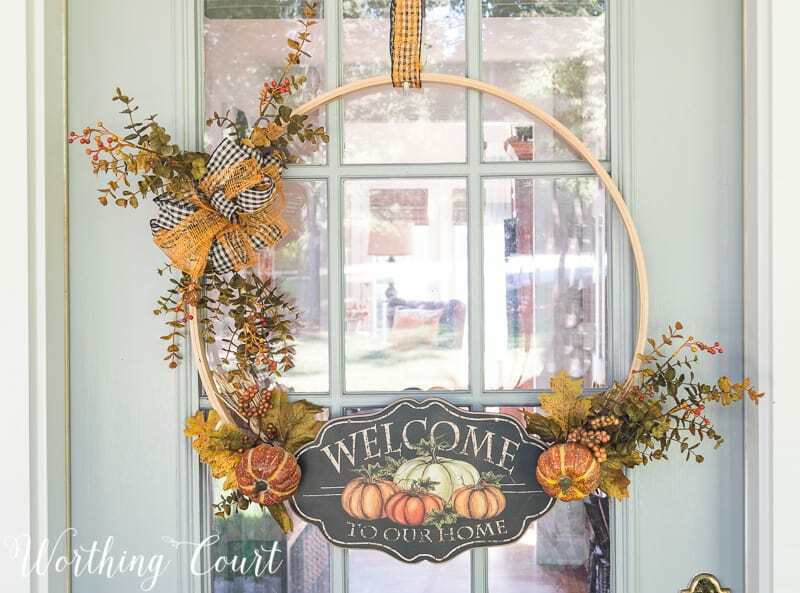 Love how you used the embroidery hoop for the wreath! I’m excited to see the tutorial!!! Your porch is beautiful. It looks quite lovely! 🙂 Like the new house colors! I have to tell you I have always loved your light fixtures. They are beautiful & what a wonderful idea for the wreath. I have several wooden hoops laying around. I just love your fresh ideas. Thanks! Love the clean fall look! Your front porch is so pretty!! I really love the copper planter. Would you mind sharing which spray paint copper color and brand you used? I can’t seem to find the right color but yours is perfect! The spray painted copper pot is great! Definitely doing that! The porch is not overdone and looks beautiful. The copper pot definitely stands out and love it! It makes one feel welcome enough to come right on in! Your front porch is lovely! I like the porch lights that are mounted on next to the door and then repeating the lantern on the porch. Definitely a winner for curb appeal!